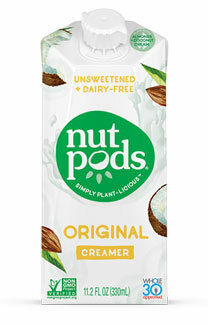 Nutpods is a dairy-free creamer made from heart-healthy almonds and MCT-rich coconuts, giving you the best-tasting and healthiest way to enjoy your coffee and other beverages. The perfect replacement for half-and-half, Nutpods creamers are free from GMO ingredients, carrageenan, soy, gluten, refined sugars and artificial ingredients, giving you the best for your body in every carton. Available in Original flavor, 11.2 fl. oz. (330mL) containers are $3.69 each. From Jennifer of piscataway, New Jersey on 5/29/2018 . I love that it's unsweetened. It imparts a creaminess to my coffee. I also add it to some sauces or soups that need a little creaminess. I don't find that it separates or adds too much coconut flavor. There's a slight hint of coconut, but that's because I don't add any sweetener to my coffee. I find the creaminess similar to heavy whipping cream.